Originally sold as part of a 10 print portfolio. From a limited run of 230 prints. ~Tom Whalen~. "Treehouse of Horrors IV". Each print is signed and numbered by the artist. ~SOLD OUT RARE MINT CONDITION PRINT~. Check Out Other Available Works. Hand-numbered edition of 275. GLOW IN THE DARK. Autobot Invitational Variant Edition Screen Print. Hand signed by artist Tom Whalen. Individually numbered, this one is PP 10/10. FOGHORN LEGHORN - Looney Tunes. VARIANT Print By Artist - Tom Whalen. Technique: Serigraph | Silkscreen. Sold out edition of only 95. By TOM WHALEN. MAD DOCTOR (2011). Official Disney/MONDO Print. Technique: Screen Print. 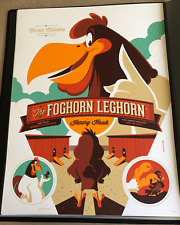 Rare Knighty Knight Bugs Bunny SOLD OUT Mondo Tom Whalen Ltd Edition AP Print. Used- The print is in overall great condition.The paper shows a few minor creases from storage. We do not have any provenance for the art. Artist: Tom Whalen (Signed). Daredevil Set (Red Reg/Yellow Var). Gallery: Mondo. Hand numbered. Limited edition. Screen print. Fabulous limitededition print designed by Tom Whalen. Format: 12x36 (31x91 cm). SUPERMAN THE ANIMATED SERIES (2018). Limited to 250 copies only. Hand numbered. Plus, I also managed to get the print signed by the artist Tom Whalen at a gallery show. DAVE KINSEY POLLUTE 2008 PRINT POSTER BLK/MRKT S/N #106/200 Fairey Obey RARE! A Must Have For All Dave Kinsey Fans! DAVE KINSEY. BY ARTIST TOM WHALEN. Foil Edition of 10 VERY RARE ! Size : 18″ x 24, strictly limited of 10, screen printed, signed and hand numbered. Fabulous print designed by Tom Whalen as a tribute to British comics 2000 A.D futuristic cop. JUDGE DREDD (2016). Format: 18x24 (46x61 cm). Limited to 110 copies only. Hand numbered. Condition: Mint. What I receive from Mondo is what you will receive. EDITION SIZE: 375. Hand numbered screen print. Printed by DL Screenprinting. Fabulous limited edition variant print designed by Tom Whalen as a tribute to British comics 2000 A.D futuristic cop. JUDGE DREDD (2016). Format: 18x24 (46x61 cm). Variant Limited to 40 copies only. Artist: Tom Whalen. Wolverine Sculpture. Gallery: Mondo. HEIGHT: 16" by WIDTH: 20". ROBIN HOOD - Mondo Screenprint by TOM WHALEN -130/290 - DISNEY. Shipped in hard cardboard tube. Some small bends at the top not very noticeable. In great condition overall. Fabulous VARIANT limitededition print designed by Tom Whalen. Format: 12x36 (31x91 cm). SUPERMAN THE ANIMATED SERIES (2018). Limited to 100 copies only. Hand numbered. Variant HAG Edition By Artist - Tom Whalen. Sold out Variant Hag Edition of only 230. Technique: Serigraph / Silk Screen. SNOW WHITE AND THE SEVEN DWARVES. Will ship within one business day. Thanks for looking! 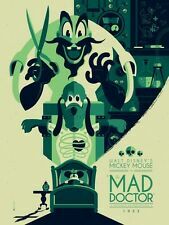 Mad Doctor by Tom Whalen Mickey Mouse 1933 Mondo Print Poster Disney. Will be wrapped in kraft paper with tissue paper protecting the front. Shipped with USPS Priority Mail in thick yahoo tube. By Tom Whalen. Variant edition.